How Is Cycling Performance These Days? Cycling is something that I have enjoyed all my life. For three of my four college years, I didn’t even own a car, riding my bike just about everywhere I needed to go. Even after college, cycling became an enjoyable, albeit, infrequent stress reliever. So when I started triathlon training back in 2007, cycling was my strongest event, allowing me to focus on running and swimming. However, things have changed a bit over the past few months. In fact, running is now on par with my cycling. While this means that my running have improved greatly, cycling has not had the attention needed to grow as much as running has. Let’s review the chart below, illustrating cycling workouts since I participated in the Carpinteria Triathlon on 9/27/09. 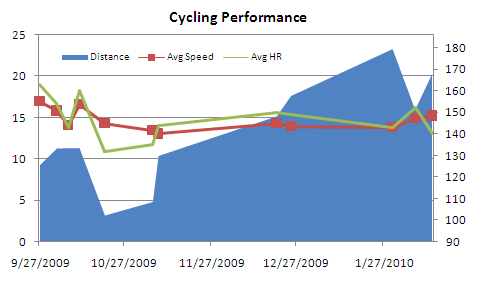 I finished the 2009 season strong, but dropped the ball on base cycling training throughout the fall/winter. Starting up again in December, distance was 50% higher than before. Where is the build phase? While cycling distance has doubled, average speed and heart metrics are not too crazy, which means I am in better shape than I was before. So how is my performance these days? Ok, but not great. Coming up on March 21st is the UCSB Triathlon which consists of a 0.5 mile ocean swim, a 16 mile bike, and a 10k run. This will be my largest triathlon event yet and I am not feeling great about it and the chart above is partially why. Time to get my act together and start training like a triathlete; not a runner; not a swimmer. When was the last time you found yourself frustrated with your training? How often do you find scheduling/time constraints impact your training? This entry was posted in analysis, Cycling, Training With Metrics, Triathlon, triathlon training, Triathlon Training Dashboard, Workout Logs and tagged analysis, Cycling, exercise, Goals, training plans, Triathlon, Triathlon Training Dashboard, workout, Workout_Logs. Bookmark the permalink.